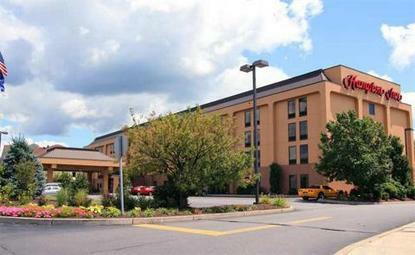 The Hotel The Hampton Inn Scranton at Montage Mountain Ski Resort is located conveniently off Interstate 81 at exit 182 (exit 182A if travelling I-81 South) in Northeast Pennsylvania, 2 miles from the Scranton / Wilkes-Barre Airport. The hotel provides complimentary high-speed wireless internet access (HSIA) and complimentary shuttle service to and from the airport. Some of our amenities include, ''On The House'' Hot Breakfast, 24 hour beverage bar serving coffee and tea, free local & 800# calls, in room hairdryers, irons, coffee makers and cable TV offering free HBO, ESPN, Nickelodeon, CNN, & TWC. The hotel is 1/2 mile from The Ford Pavillion and 1/2 mile from Lackawanna County Stadium where the Scranton / Wilkes-Barre AAA Red Barons play. The triple AHL Penguins hockey team plays in the Wachovia Arena, 10 miles from our location. We are 2 miles from the Mall at Steamtown and Steamtown National Historic Park, University of Scranton, 30 miles from Pocono International Raceway, 3 miles from Hoop City and The Ice Box hockey arena. The hotel is 2 hours from Philadelphia and 2 hours from New York City. Marvelous Muggs Restaurant is adjacent to the hotel, serving lunch and dinner along with other exellent resturants nearby. Our spacious fireplace lobby overlooks the ski slopes of Montage Mountain. Some features of the hotel include a large indoor heated pool and spa orverlooking Montage Mountain, exercise facility, two meeting rooms, Jacuzzi Fireplace Suites, free parking, and a game room. The property also features Mountainveiw guest rooms, two meeting rooms, and a work center.